CBS Sports college football writer Dennis Dodd took on the ambitious task of examining all 130 Division I coaching situations and assigning a value from 1 to 5 relating to the stability of each coach’s job status. On the scale of 1-5 with 5 being “win or be fired,” the Big Ten doesn’t have a single coach higher than a 2. 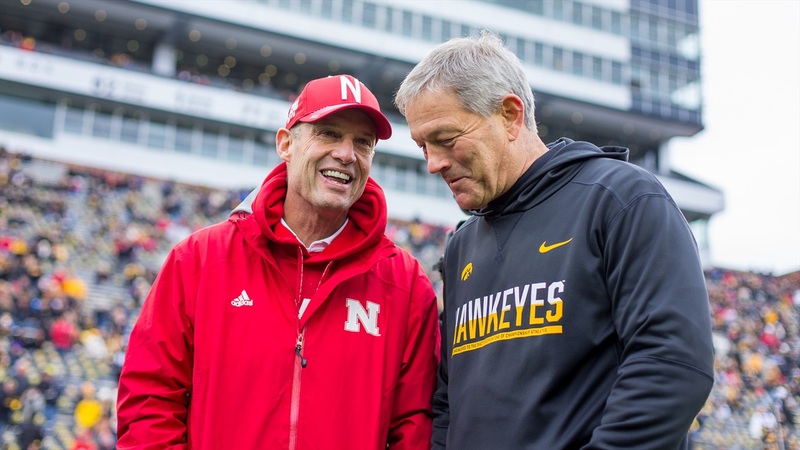 That speaks in part to the strength of the conference with two of the most highly-regarded coaches in the country in Meyer and Harbaugh plus the likes of Ferentz, Fitzgerald, Dantonio and Franklin. The rest of the teams in the league who might have had coaches on the hot seat in recent years have all moved on from them, starting the cycle over with some younger coaches on the rise, for the most part. The two that don’t fit into that category are Smith and Riley as coaches with decades of experience, and based on how those two programs have done under them it makes sense to put them in the “all good for now” category for this coming season. Both players would have to finish well below .500 in order to actually lose their jobs after this season, but another disappointing year could move them closer to the hot seat. Expanding our scope, Dodd only listed two coaches as those that need to win to keep their jobs: Notre Dame’s Brian Kelly and Texas A&M’s Kevin Sumlin. He listed four others that have to start winning now: Arizona’s Rich Rodriguez, Arizona State’s Todd Graham, Kent State’s Paul Haynes and Texas Tech’s Kliff Kingsbury. Transitioning from coaches to a coach on the field (cliché aside), the Lincoln Journal Star’s Steven M. Sipple put a spotlight on senior inside linebacker Chris Weber on Wednesday. Weber is the latest in the long line of Nebraska walk-on success stories. The Elkhorn product paid his own way out of high school, worked his way onto the field, earned a scholarship and now is in line to start at inside linebacker alongside Dedrick Young. Josh Banderas held down the middle linebacker spot for a couple years before exhausting his eligibility at the end of last season, but Weber wasn’t the typical back-up who saw nothing but garbage time. Weber started three games as a sophomore and was outstanding, and linebackers coach Trent Bray has said that Weber probably didn’t see enough time on defense last year (thanks in large part to Banderas staying healthy all season). Weber is more than ready for this role, and in fact, Bray has also said Weber is a perfect fit for the new 3-4 defense. Weber is a tackling machine who is always around the ball because of his terrific instincts, and now up to 240 pounds, he can bring the physicality needed for the position. In addition to what he provides on game days, Weber is also the perfect example for Nebraska’s young but incredibly talented reserve inside linebackers. Mohamed Barry and Avery Roberts both have physical tools that neither Weber nor Young bring to the table, and if those two follow in Weber’s footsteps in terms of work ethic and attention to detail, they both could develop into future stars. Linebacker is an important position in Bob Diaco’s defense, and the new Nebraska defensive coordinator couldn’t have asked for a better leader on the interior to help the Huskers make this transition. Former Husker libero Justine Wong-Orantes has been named to the 14-player U.S. Women’s National Team roster for the FIVB World Grand Prix starting on Friday. The roster has a heavy Big Ten flavor with 10 players hailing from the conference. Mike Riley has compared walk-on running back Wyatt Mazour to Danny Woodhead in the past, and apparently Mazour got the chance to work out with Woodhead and Detroit Lion running back Zach Zenner. Hogs Haven writes why Washington has one of the best offensive lines in the NFL and former Husker Spencer Long is a big part of that. NFL writers remembered on Tuesday that Ameer Abdullah is really good at football. Cleveland Cavaliers owner Dan Gilbert reportedly offered a deal far below market value to Chauncey Billups to take over as general manager of the reigning Eastern Conference champion, and Billups declined. Gilbert is notorious for being unwilling to pay even average value to executives, and his last several GMs moved on without getting a second contract. David Griffin was one of the most respected executives in the league who made far less than most of his counterparts and was not brought back after failing to come to an agreement with the organization last month. Oh, and LeBron James – who had a great relationship with Griffin – is a free agent after the 2017-18 season. Good luck, Tyronn Lue.